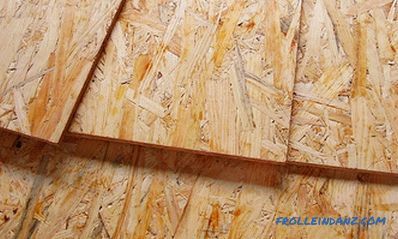 Oriented strand board (OSB) is widely used in construction today. The technical characteristics and the structure of the material provide it with reliability, lightness, high strength, certain aesthetic properties and affordability. The article describes in detail the characteristics and application of PCA, as well as the features of working with them. Externally, OSB plates differ markedly from MDF and particleboard due to the structure features. In the production of the material, thin and long wood chips are used, which are oriented longitudinally in the outer layers and transversely in the inner layers. Even in cases where the orientation is not too obvious, OSB can be recognized immediately by the large, compared with other wood plates, pressed elements. The length of the chips in the plate is 75-150 mm, and width - 15-25 mm. Due to this orientation of the chips, the OSB plate acquired properties that greatly expanded its areas of application. 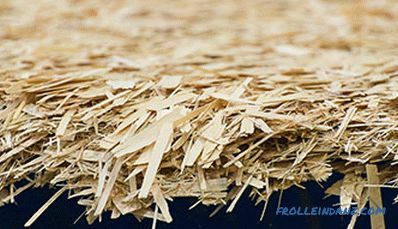 OSB is produced by pressing flat wood chips mixed with a binding material using special equipment, primarily modern high-tech pressing lines. 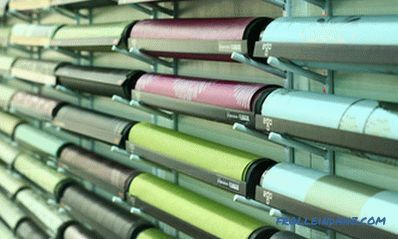 Large factories in the USA and Europe uses ContiRoll - continuous pressing lines. 1. Raw material sorting . Timber of such tree species as aspen, spruce, pine and poplar are used as raw material for chipboard production. After the raw materials are delivered to the production line, a careful selection of logs is made. 2. Preparation of raw materials and production of chips . After sorting, mechanized debarking of logs is performed. 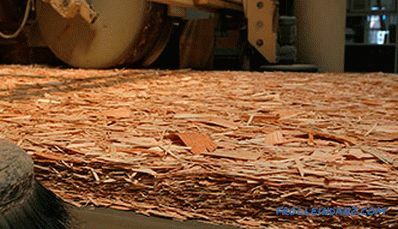 Next, peeled logs are cut into short pieces and sent to a planer installation, where they are split into chips along the direction of the wood fibers. At the end of the stage, the chips are dried by the conveyor method and sorted. 3. Preparation of the composition for pressing and molding . As a binder for OSB, wax and adhesives based on paraffin, phenol-formaldehyde or isocyanate resin and boric acid are used, with which the chips are mixed in stages. Then, the mixture obtained is transferred to the molding station, where it is rolled out and molded into a uniform carpet before being sent under a press. 4. Pressing plates . The plate is pressed under the pressure of 5N / mm 2 and at the temperature required for the resin to solidify - 170-200 degrees. Temperature and pressure in the pressing zone is constantly monitored. After pressing and trimming, the material is subjected to control measurements of thickness and density, as well as checking for defects, and then aged for 48 hours before the final polymerization of the binder compositions. 5. Cutting and packing . After a quality control check, the OSB canvas is cut into elements of the standard format, the edges of the elements are profiled, and the resulting plates are sent to the marking and packaging line. The main producers of OSB boards are Canada, Austria, USA, and the Baltic States. OSB production lines were opened in China, however, due to the poor quality of the plates, Chinese products did not become popular. 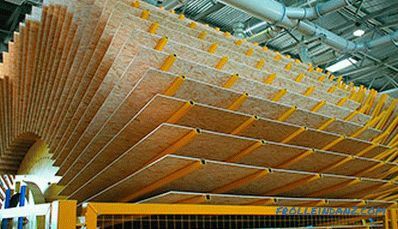 In the period from 2012 to 2016, production of oriented strand boards was launched in Russia, where, with the proper quality of the material, it was possible to achieve a lower cost. Depending on the quantitative and qualitative parameters of OSB plates are divided into 4 classes. OSB-1 . 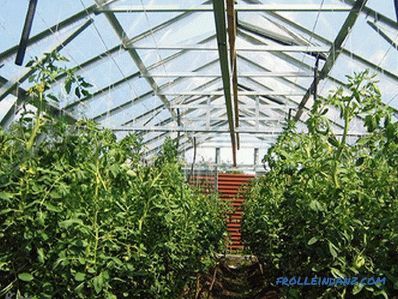 Due to the lowest moisture resistance compared to plates of other classes, it can be used exclusively in dry conditions in unloaded structures. OSB-2 . The material is used for the erection of structures, with the carrying load on them. It is used exclusively in dry conditions. OSB-3 . The most common material class in decoration and construction. It can withstand load-bearing loads and has an optimal price / functionality ratio. 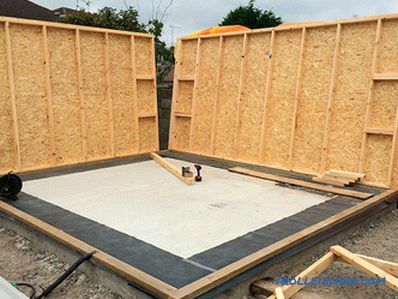 The technical characteristics of the OSB-3 plate ensure the use of the material, including in wet conditions. OSB-4 . These are the most durable and expensive materials.Increased reliability allows the use of material in building structures with large loads in wet conditions. In this case, the term “dry conditions” implies that the air humidity at a temperature of 20 0 C, can exceed the threshold of 65% for only a few weeks a year. The term "wet conditions" suggests that air humidity at a temperature of 20 0 C, only a few weeks a year can exceed the threshold of 85%. Strength characteristics of OSB boards may vary slightly depending on the manufacturer. However, there are standards for which manufacturers and manufactured products must comply with them. Most often it is possible to meet the plates made according to the European standard EN 300. For the production of OSB plates natural wood is used, which cannot but respond to the effects of moisture and any atmospheric changes. Plates of all classes, including OSB-3 and OSB-4, are not waterproof. Waterproof is only glue, which does not lose its qualities when in contact with water. However, the stove itself must be completely isolated from direct humidification. With direct ingress of moisture on the slab, its increase in volume and deterioration of strength characteristics are observed. To determine whether the panels are resistant to moisture, a parameter such as swelling is used. For its determination, the plate is immersed in water for 24 hours, and then the degree of its increase is calculated in connection with the amount of water absorbed. As can be seen from the table, OSB 3 and 4 class show the least degree of swelling and, as consequence, the highest moisture resistance. This material is recommended to use in the manufacture of building structures of various types. Vapor permeability remains an important characteristic of OSB slabs, about which there is a lot of controversy. In this case, various methods of calculating this indicator can be used. Thus, a number of manufacturers use the following indicator in labeling: Water vapor permeability, μ (dry / wet). The value of this indicator can be written as: 200/150. This is a comparative coefficient of vapor permeability of a plate in a dry and wet state. But it only shows how much worse the OSB cooks steam compared to air. The above example shows that the stove conducts steam 200 times worse than air. Knowing this value, using special formulas for calculating vapor permeability, one can determine that the vapor permeability coefficient of OSB is 0.0031 mg / (m · h · Pa). 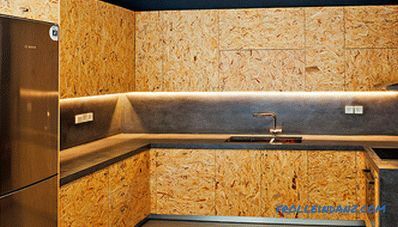 The result clearly demonstrates that the oriented strand board has extremely low vapor permeability, comparable to the same property of foam glass or linoleum on a fabric basis.The whole problem lies in the production technology. OSB stove is not reading wood, but a mixture of wood and resin, which have low vapor permeability. Due to the composition and structure, oriented strand boards are amenable to various types of processing. Their planing, grinding, drilling, grinding, sawing and milling are allowed. 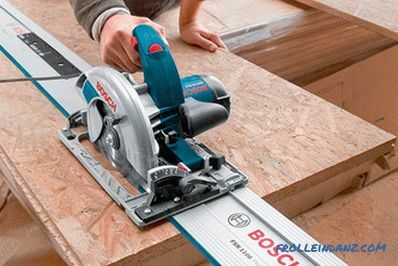 OSB can be handled with both stationary and portable electric and hand joinery tools, which are recommended to be equipped with carbide blades. reduced tool speed during sawing. 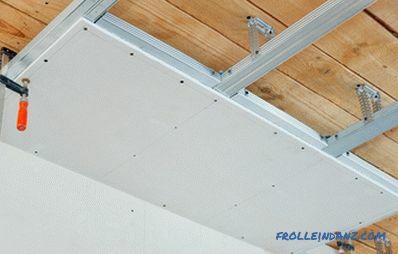 One of the key points in working with an oriented strand board is ensuring safety for life and health. 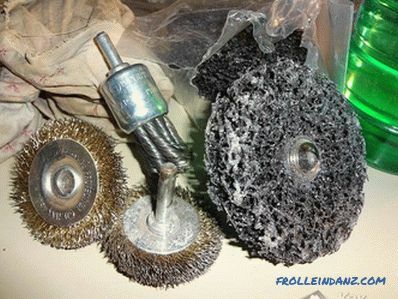 Dust emitted during mechanical manipulations is a strong carcinogen, therefore it is strongly recommended to carry out any work with OSB in overalls, it is necessary to use a mask or respirator and choose instruments with suction. It is highly desirable to have in-room ventilation. 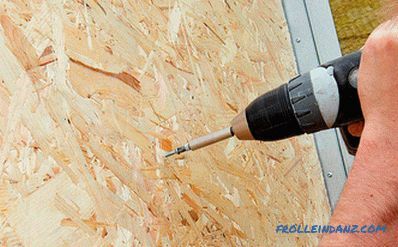 The combination of high density and fibrous OSB provides all the conditions for high-quality fastener retention - the fixing strength is even high on the outer edge of the panel. All types of fasteners suitable for wood-based materials, including screws, nails and staples, are allowed. Fix the fasteners can be already 10 mm from the edge of the plate without fear of breakage or delamination of the material. In extreme cases, you can drive nails at a distance of 6 mm from the edge, but this requires special care. Oriented strand boards of all four classes have a good bezel. However, you should be aware that there are certain requirements for fasteners used for mounting panels. The length of the fastener must not be less than 2.5 times the thickness of the plate, but must not be less than 50 mm. If you need to use staples you need to pay attention to the thickness of the wire staples, it must be at least 1.53 millimeters. According to DIN 1052-2 standard for OSB plates, it is recommended to use fasteners made of stainless or galvanized steel. There are certain requirements for the shape of nails - the best option are nails with a flat cap and thread, chute or annular groove. Due to the high resistance to pulling out, the nail head is not excessively buried in the slab. When using nail guns during installation, you must use special glasses and strict adherence to safety regulations. Mandatory priming before painting. When using polished slabs, primers should be applied in two layers due to the increased ability of polished OSB to absorb paint, linseed oil and stain. Application of primer coatings with certain properties. For OSB, it is desirable to use formulations that provide a high level of protection against mold. The slabs can also be stained well, but it does not provide good protection of the material against moisture, and therefore is not used as often. Easy sanding the surface after applying each coat of primer or paint. Such processing provides a uniform distribution of coloring compositions and an attractive appearance of the panels. Use of durable waterproof paints. The optimal solution for oriented strand boards is the application of a finishing layer using varnishes or acrylic-based lacquer paints. Gluing of OSB panels is possible with the help of any adhesive compositions used for wood. Grinding the surface before adhesive treatment will significantly increase the strength of the joint. OSB plates have sufficient biological resistance, however, if they are kept under conditions of high humidity and temperature extremes for a long time, the risk of material damage from molds increases. 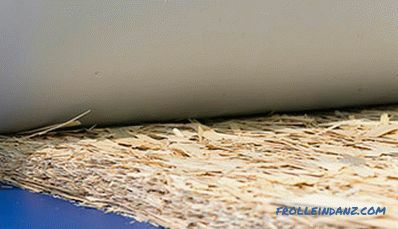 First of all, it concerns panels made of spruce or aspen chips - pine and maple chips show a higher resistance to mold. 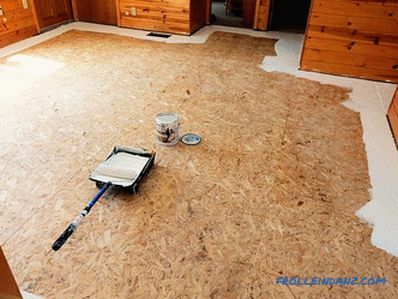 To protect the OSB of the plate from the effects of fungi and bacteria, it is necessary to use moisture-proof materials, as well as the use of paints and varnishes with protective properties. 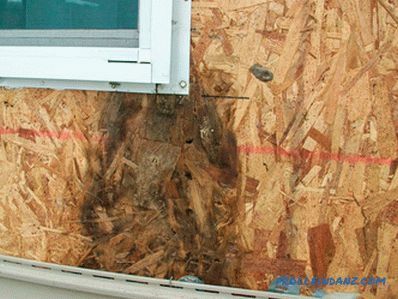 OSB affected by mold due to the negative impact of the external environment. One of the controversial points in the technical characteristics of the OSB of the plates - is the harmfulness and toxicity of the material to people. 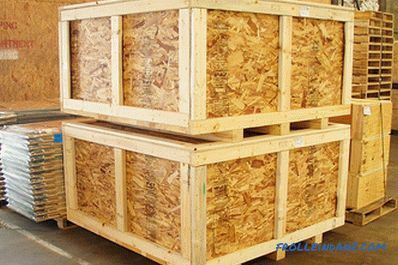 Indeed, melamine-formaldehyde, urea-formaldehyde and phenol-formaldehyde resins are used as binders for OSB, which, under the influence of high temperatures, release free formaldehyde. That is why there is a perception that this material is more dangerous than chipboard and plywood. However, this is nothing more than a delusion. The fact is that the content of glue and resins in the composition of oriented strand boards does not exceed 3% - for particle board this indicator is 12-14%. Thus, manufacturers managed to achieve emission (emission) of formaldehyde not higher than 8 mg per 100 grams of dry plate. 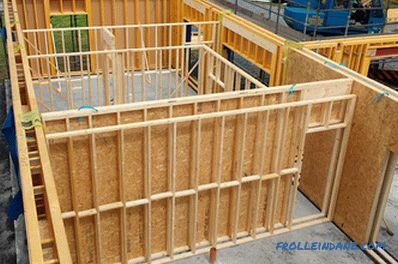 Some experts argue that even if OSB plates are produced in violation of environmental requirements, they will have less formaldehyde emissions than chipboard and even plywood. In addition, today formaldehyde resins are increasingly being replaced by glue based on MDI, an aromatic diisocyanate, which has extremely low toxicity. But the cost of these materials is higher. Continuous improvement of the technology of creating PCBs can significantly improve the environmental friendliness of the material. E3 - 1, 0 - 2.3 ppm, when converted to mg / m³, will be from 1.25 - 2.87 mg / m³. It is allowed to use materials with formaldehyde emission level E1 - E2 in construction. Materials with an E3 emission level are prohibited. No matter how environmentally friendly a material is, the release of formaldehyde in a certain amount still happens. Most of all, it stands out during the first year of operation of the material. To determine the fire safety of a material, the flammability classification according to GOST 30244-94 is used. Class D-1 (low-combustible) . 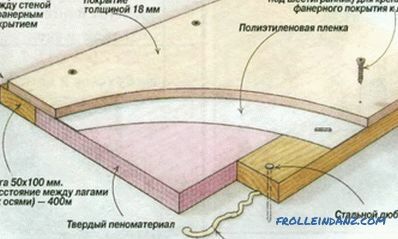 Materials with a degree of damage in the area of ​​not more than 65% with a degree of destruction of not more than 20%. The flue gas temperature during combustion does not exceed 135 degrees. Melt drops are not formed. Class D-2 (moderately combustible) . The group of materials, the degree of damage to which during combustion is not more than 85%, the degree of destruction does not exceed 50%, and independent burning is a maximum of 30 seconds. Flue gas temperature - up to 235 degrees. Melt droplets are not allowed to form. Class D-3 (normally combustible) . The flammability characteristics are similar to class G-2 - with a discrepancy in self-burning (300 seconds) and flue gas temperature (450 degrees). Class D-4 (highly combustible) . Materials of this class have a degree of damage on the area when burning more than 85%, the degree of destruction is more than 50% percent, and independent burning - more than 300 seconds. The temperature of the flue gas exceeds 450 degrees. Because of the wood shavings that make up the OSB, it is easily flammable, forcing it to fall into class G-4. To increase fire safety in rooms lined with OSB boards, as well as structures made from this material, it is recommended to install a layer of refractory material - for example, mineral wool. In addition, manufacturers seek to improve the class of flammability of oriented strand boards by adding flame retardants (boric acid) to the composition or by additional impregnation of the panel with flame retardants. Resistance of building materials to heat transfer is an indicator of their ability to retain heat and not pass cold. Heat transfer resistance is especially important for residential buildings. For OSB, this indicator is in direct proportion to the thickness and density of the plate. Heat transfer resistance, (m 2 . ®C / W). The material is resistant to deformation and is compatible with any decorative and facing materials. Depending on where it is planned to use OSB - for exterior or interior decoration - panels of a certain class are selected. 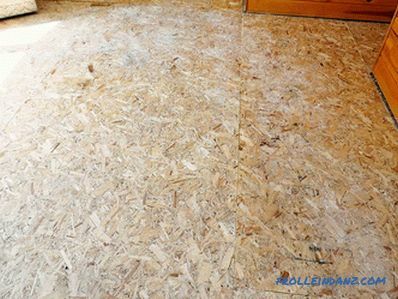 OSB is suitable for flooring seamless floors on a wooden base on wooden beams or a seamless floor on a concrete base. Compatible with any soundproofing and heat insulating materials. 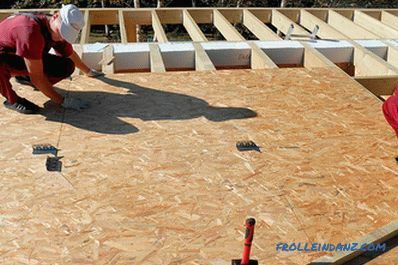 In lightweight building structures, OSB boards are used as a separate flooring. Due to sufficient strength and elasticity, oriented strand boards can withstand severe wind loads. Used under any roofing materials, but most often under a flexible tile. The stiffness of OSB ensures the reliability of any structure, resistance to displacement and deflection of any structural elements, as well as the absence of squeaks. 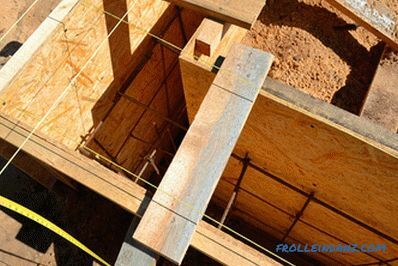 For repeated use, the formwork is made of ground or laminated OSB. 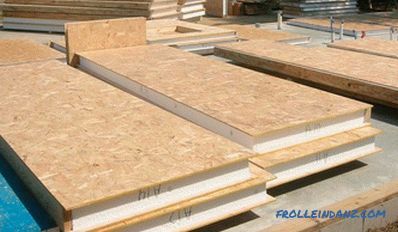 Oriented strand board acts as outer layers between which expanded polystyrene is laid. OSB often serves as a raw material for the manufacture of containers for various cargoes, including bulky ones. Construction of quick-detachable structures, billboards, temporary barriers. OSB boards of various thickness (except for OSB-1 class panels) are used to make both functional and decorative elements - backs and seats chairs, cases and back walls of cases and dressers. Oriented particle boards have an impressive list of advantages, including increased durability, reliability, lightness, simplicity of processing and a high degree of environmental friendliness compared to materials of similar composition and structure. 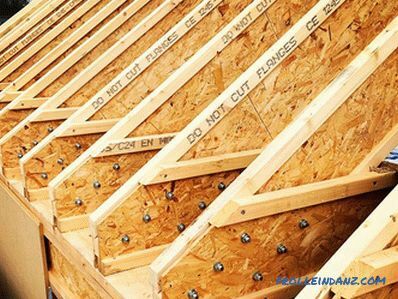 At observance of all rules and standards of work with the OSB panels, the long term of operation of elements and designs without any changes and destruction of material is possible.